March 30, 2012: After a tiring day in Hyderabad, I was looking at my options to return to Bangalore. I called my brother in Bangalore to check availability of tickets in Karnataka SRTC for that night. He couldn’t book online due to some issues with the reservation website. I now asked my cab driver to head straight to Hyderabad Mahatma Gandhi Bus Station. I first went to the APSRTC counter to see if there were tickets in the Vennela Sleeper – but only upper berths were vacant. I went to the KSRTC counter to check for tickets in their evening buses. 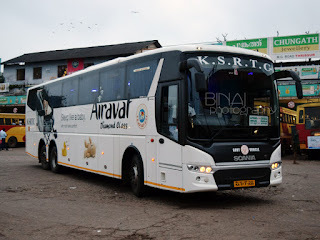 I specifically asked for a Multi-axle Volvo – he issued tickets for the “2001HYDBNG” Airavat Club Class bus. I was looking for a bus later in the night, but he was adamant to sell this bus. I got a right side window seat, and headed back to my hotel room in my cab. After a quick bath, I asked the same cabbie to drop me back at MGBS. I reached MGBS at around 1900hrs. I walked around the bus station to click some pictures – but did not notice anything interesting. An entire day starving meant that my gastrointestinal tract was not in great shape. I did not want to have any heavy dinner, and hence decided to wait till the bus takes a break for dinner. By now, Platform 23 at MGBS was heating up. 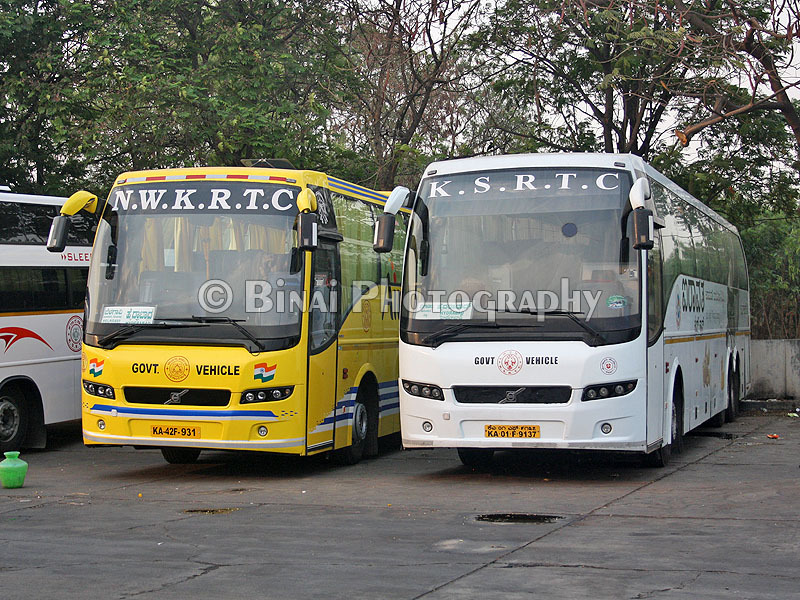 KSRTC was lining up their buses to Bangalore, one after the other. 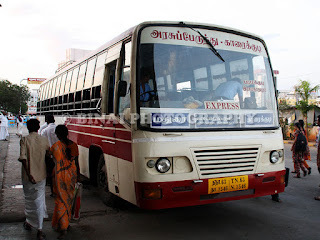 APSRTC did not have buses to Bangalore at that point of time, but they had their buses to various parts of Andhra now. My bus was brought in at 1948hrs. I did not want to waste time clicking pictures – just walked to the conductor, showed my ticket and got into the bus. My co-passenger was already at the seat. I got into my seat (#16) and waited for the bus to depart. The interiors did smell bad – not really fresh. They did not use any air-fresheners to lighten our difficulty. I checked if it was the blankets that emitted the foul smell – but that was not the case. My bus backed out of the platform exactly at 2000hrs, and got moving quickly. We had about 40 passengers on board, and hence the crew did not try getting more. The layout of MGBS is not exactly great – buses from some platforms have to drive in the opposite direction to reach the exit gate. I guess APSRTC needs to add another entry/exit gate for the bus station. The conductor quickly checked if all passengers were inside, and started distributing water bottles to passengers. He issued tickets to passengers without a reservation and checked if passengers had any requests. A movie was played on the entertainment system – not a full movie, but part of a movie. They played only the climax of a recent bollywood flick. Passengers were not interested in watching the movie anyways – no body protested when the move finished in less than 30 minutes. I slowly drifted off to sleep. I had a short nap, and woke up just when the bus stopped for dinner – at Hotel Yagnesh Virat Regency, Jadcherla (2145hrs). The food on offer did not look very inviting, but I still had a plate of Chapati with some vegetable curry. The food was too expensive for the quality. After stuffing down the food, I decided to stay around my bus for some time. The hotel is on the highway, and is a regular stopping point for various operators on the route. My bus had stopped at this very place for breakfast on my previous trip from Hyderabad to Bangalore – then, the food was good. We left the hotel at 2215 hrs. The curtains were drawn and lights were switched off. I reclined the seat to the maximum, and adjust the calf rests. All I remember is lying down to sleep. I woke up sometime around midnight – it was raining like crazy at that time. My co-passenger was struggling to sleep, while I was fast asleep all the time. I slept off soon afterwards. The ride was smooth – no hard brakes or rash cuts. I slept like a baby with multi-axle comfort for most of the time. I woke up just as the conductor switched on the lights and shouted...“Hebbal” (0520hrs). A good number of passengers got off here. Our next stop was at Mekhri Circle (0525hrs). I was in a semi-awake state and did not notice much of what was happening outside. However, from what I could gather, we weren’t following any conventional route. We took some short cuts here and there, and we landed up straight at Anand Rao Circle. The driver cut short the route and landed up outside Majestic straight away. The bus stopped near the subway outside Kempegowda Bus Station (Majestic) dot at 0535 hrs. It was drizzling outside. I asked if the bus would drop me at Shantinagar (as claimed by their website) – a blunt “no” was the reply. I was just thinking of ways to avoid getting drenched. With no other options, I got off the bus, and made my way to the city bus station. I was headed straight to the Volvo platform, right in time to see a Volvo on #360B waiting to start its day. The bus dropped me at my place about 40 minutes later. The bus was from the first lot of Volvo multi-axles. The bus had done over 2 lakh kms, but was in fairly good shape. The ride was good – no unusual noises from anywhere. 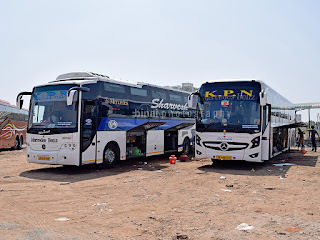 The crew did lie a lot to passengers – a lady was misguided to believe that the bus would drop her at Marathahalli, while many others were led to believe that they would be able to get off at Shantinagar! That lady finally had to get off at Hebbal early in the morning to find her way home. Otherwise, the crew did their job fairly well. The bus was clean both inside and outside. 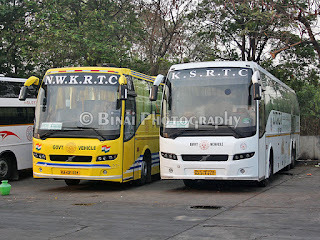 I chose KSRTC with the intention of being able to sleep for some time – and my aim was fulfilled. The bus took 9 hours and 35 minutes, including 30 minutes break for dinner, end-to-end. This compares with the 8-hour run done by APSRTC.